It's not too often that I get a chance to do some good rail-fanning, and it's not until recently that I've had a camera good enough to really get good pictures. Luckily my work can occasionally make it easier to do some train chasing. No, I'm not running out and chasing trains in the middle of the work day, but being on the road does take me to plenty of different locations where I can do some railfanning. 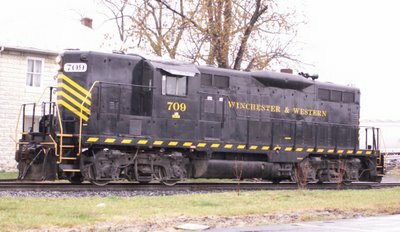 The Winchester and Western railroad happens to be very close to one of my employer's facilities, so it's not too difficult to get a picture or two of the locomotives in operation. The W&W (known to many locals as the old 'Weak and Weary' because of it's limited activity) was originally created during WW-I as a way to move lumber from the hills around Winchester to the B&O mainline. Now it runs from Gore to Winchester and most of it's business comes from a local quarry. Most of the locomotives are older EMD units, although there are at least a few more unusual units on their roster. Here's just a taste (I'll get more photos the next time I'm back there) Engine no 709. It doesn't really hold as much appeal as a steam locomotive, but it's still nice to see something like this up close. Hopefully I'll get more chances to go railfanning soon.